Hoylake is to hold a week-long Halloween Scare Festival ! This is the first major event organised by a newly formed group of locals whose aim is to get more people to visit the shops and businesses of Hoylake. From Monday 26 – Saturday 31 October shops and businesses along the whole length of Market Street will compete to produce the Best Halloween Shop Window Display. I’ll publish some photos in due course and I’ll let you know the winning display. does this event not include shops in Birkenhead Road or is it because I am closing you didn’t think I would be interested in helping raise the profile of Hoylake. I would’ve presumed it’d include shops in your “block” but I’m not involved in the group so I can’t say for certain. I’ll send a note to one of the organisers on your behalf. By the way, are you opening a different business in your shop? Unfortunately, I gather the organisers thought that you’d already closed. Maybe, if you find the time you could still decorate your shop? 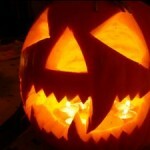 Has hallowen been promotted in England for very long? I was under impression it was a North American (NOT UNITED States) phenoman. I thought Guy Fawkes night, with bonfires and food was the big celebration. Or will the EU not allow fires? A qustion about the past anybody know of the Banks family that lived at # 20 Trinty Rd. up to possibly 1954. Thank you Richard, from Windsor Ont. It seems to be a big thing now but as you say it never used to be so. I guess that bonfires and fireworks are difficult unless yoyu have a large garden and public displays are not very participative so Haloween seems to have taken over. Personaly, I think saving my pocket money and going to to Hoylake Sports on Market St (now Carphone Warehouse)and choosing fireworks from the glass display cabinets was one of the highlights of my year. We used to go to the Speed family’s fireworks party at The Chase on Barton Road every year, my mum always made fudge and ‘Auntie’ Jane Egleton from The King’s Gap always did the toffee apples. The bonfire was in the paddock. Sadly The Chase, one of Hoylake’s oldest houses, was destroyed to make way for the rather bland ‘executive residences’ that form Barton Close. We used to call Haloween “duck apple night” and you had to pick and apple out of a bucket of water without using your hands (someone usually held your head under water!) Bonfire night was king, there was a big fire on the shore in front of Trinity Road, another on the sandhills between Roman Road and Monkey Wood and I think before they build the newer houses at the bottom of Sandringham Avenue, there was another bonfire there. Standard Fireworks used to do selection boxes, five bob or half a crown. Bangers were thrupence and sixpence. Rip-raps zig zagged between your feet. Someones mum bought a five bob rocket and we all made sure we were there to see it go off at 9pm (it was all over in about 4 seconds!). The day after bonfire night we would search for spent rockets, and for days the milk always tasted of gunpowder as the bottles were used for rockets. Ah yes, there was usually a bonfire on the field over the railway at the end of Melrose avenue. Was this at the Rugby Club, i think they still do a display, or have done in the past as my twin boys used to watch from their bedroom window, quite a show i recall. It is nice to see merchants supporting this event. Around here the only thing in store windows is for sale,no decorations, and for Dec. 25 DO NOT mention Christmss. We were approached to do a halloween window, not specifically scary although some of our regular(loyal?) customers suggested that our window, ‘Witches of Hoylake’ should have photos of the management team which might be construed as scary!! I do love Hoylake and the fantastic sense of humour. Having worked in Hoylake for the last 7 years – travelling in from North Wales, do spend my lunch break along the main street. At a time when retailers are feeling the pinch I must congratulate shopkeepers and service providers for making an effort for their Halloween event. It certainly made me look into the store windows. Other towns should take a leaf out of your book – at least you are encouraging shoppers to visit and spend in the area.